There seems to be at least one person in every family who is either unable, or unwilling, to comprehend the nature of a special needs child. This person usually speaks without thinking, often causing us parents to cringe, or worse, to cry. We are used to strangers coming up and saying things that astound us by their complete ignorance. These people don't know us or our children, and often don't realize their comments hurt. However, when it is a family member who says, or does, something completely ignorant, it is hard to let it go. In my family I have one major offender of the above crime. This person is constantly saying things that make me slap my own forehead, when really I want to slap hers. The last time we were at a family gathering she introduced Thomas as her "special grandson." UGH! The time before that she asked me "do you think Thomas can understand what we are saying?" To which I replied, "Yes, of course he can." Her next question, "Do you think he wonders why he is different than everybody else?" Oh my God woman! Did you not hear my previous answer that he DOES indeed understand what you are saying? Then why on Earth would you ask such an asinine question as a follow up? The last time I saw her was at a smaller gathering which included a friend of my uncle. This friend, who I did not know, asked my cousin if Thomas was the "special one" she had heard about. UGH UGH UGH! What in the world are we supposed to do with family like this? Strangers are easy, we don't have to like them, we don't have to explain anything to them, and we likely will never see them again. But with family we do have to see them again, we do have to like them, and we do have to explain. Or do we? It has become my new policy that I will only surround Thomas with those who are supportive and who lift him up instead of those who seem to thrill when he falls. I have received a lot of flak for this policy. Other family members think that because She is my family I should forgive and forget. They don't understand what it's like to fight tooth and nail for every small achievement in a special needs child's life. To fight the insurance company, the schools, the doctors, and whoever else out there wants to stand in the way of our child and what we believe is best for them. It is my opinion that family should be the one group I shouldn't have to fight. They should be supportive and helpful. They should be next to me, cheering Thomas on to his next goal, that next great achievement. By allowing those who do not do those things to be in his life I am doing a disservice to him. Thomas has enough hurdles to face in this world, I won't knowingly give him another by allowing anyone, family or not, to stand in his way. I'm almost officially old. Today I turned 29. As I sat here reflecting on my life up to this point I realized that I am almost exactly where I always planned to be. All my life I wanted one thing, to be a stay at home mom. Well, there was that other thing about marrying a rich man, but we can't have it all now can we? And here I am, at 29, living my dream. Except nowhere in my dreams did I ever imagine how difficult it would be. I never entertained the notion that my child would be anything less than amazing. My child would be the next Einstein. He would be the first amongst his peers to roll, to crawl, to talk and to walk. He'd be famous by age two because he was so incredibly gifted the world would stand up and take notice. However, in many ways my life as Thomas' mom has exceeded the dream. He is amazing. He is beautiful. He has the ability to touch the hearts of all those around him, and even those who only know him through my writing. He is more than any child I could have imagined having. Sure we have our troubles and there are things I wish with all my heart he could do, but I wouldn't trade him for anything or anyone. He is so much better than that dream child I had. That dream child was what I thought I wanted. Thomas is everything I know I NEED. Without him life was boring and predictable. With him I never know what to expect, good or bad, he keeps me on my toes. His laughter keeps me smiling, and his kisses fill my heart to bursting. So today, on my birthday, even though he is not able to buy me a gift or wish me a happy birthday, he has given me the best gift of all. A gift that needs no ribbons, no pretty paper, and no card. The gift of being a mother, his mother. 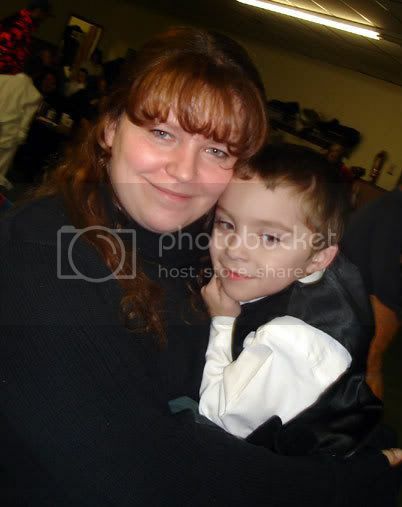 Thomas is my son who happens to have cerebral palsy. He is, in my opinion, more on the mildly affected side. He can crawl, sit on his knees, and laugh like a madman. He uses a walker to walk when his legs will cooperate. He cannot talk, sit on his bottom without falling over, or do a lot of the basic things most of us take for granted in life. He is, however, the light of my life and my reason for existing. He doesn’t know he has cerebral palsy. He doesn’t know there are things out there others are doing that he cannot. He does know that little brothers were put on this earth as a form of torture, that dum dum suckers are absolutely the best food on the planet, and that laughter is in fact the best medicine.